GOOD MORNING my creative friends! Welcome to day 4 of our TWELVE DAYS OF CHRISTMAS! 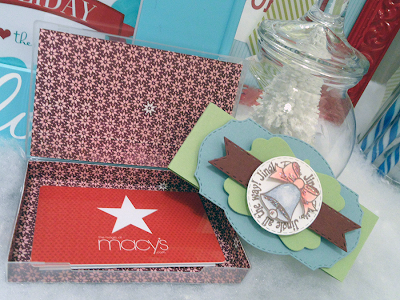 Today I have a SUPER CUTE, EASY & FUN project for you today! I used one of my FAVORITE dies that I came out with LAST Year, but I just LOVE it & it is my "GO TO die" for cute treats! Yep, it's my "Stitched Lollipop Holder Die"! To this day, I cannot keep this on our shelves! This is one popular die that you will use over & over again! I think I get to use it for EVERY occasion & not to mention.... holidays! I want to share a funny story with you! When I went to sleep lastnight, I was actually stressing out a little because I had NO IDEA what I was going to make for today! Then, it came to me at 4:30 am! Yep, you heard that right...4:30AM! lol.... I am positive I am not the only crafter this has happened to! hahaha! Okay, well, I decided to keep this simple, but classy looking enough where you can make these for your co-workers, stocking stuffers, little Secret Santa gifts..etc....AND they are perfect for your child's classmates & not to mention...teachers! You can see in my video below EXACTLY how I put this together! Didn't this come out SOOO STINKIN CUTE? I decided to add the little banner from my "Vintage Stitched Label Dies" Then I add the sentiment from my "Gift Card Sentiments"! ~ Banner from "Vintage Stitched Label Dies"
Love the lollipop die!! Great project! I am off to make one myself now, great idea, the kids will love it!! Thanks for sharing your ideas again! Super cute, Emma. These would be so fast and easy to mass produce, too. this is again super adorable Emma!! I LOVE this die and have to pull it out again....you are so right, they would make adorable kids classroom treats! Thanks for sharing this GREAT gift idea!!! These are precious! I know my kids will want me to get that die now that I showed them how cute the pops are. They will be the hit of their classes. This has been such a fun week so far, can't wait to see what tomorrow brings. Thanks again, Emma. slbuller at fullchannel dot net. Very cute project and a great idea! I enjoy watching your videos - it is like I am crafting with a friend! I love the lollipop holder! I think I need to get one of those dies! Thanks for sharing all of the really cute projects, too. I love it. I just purchased that die so guess what I'll be making? Great job once again! Really loving your 12 days. Thanks for the opportunity to snag some really great crafting tools. 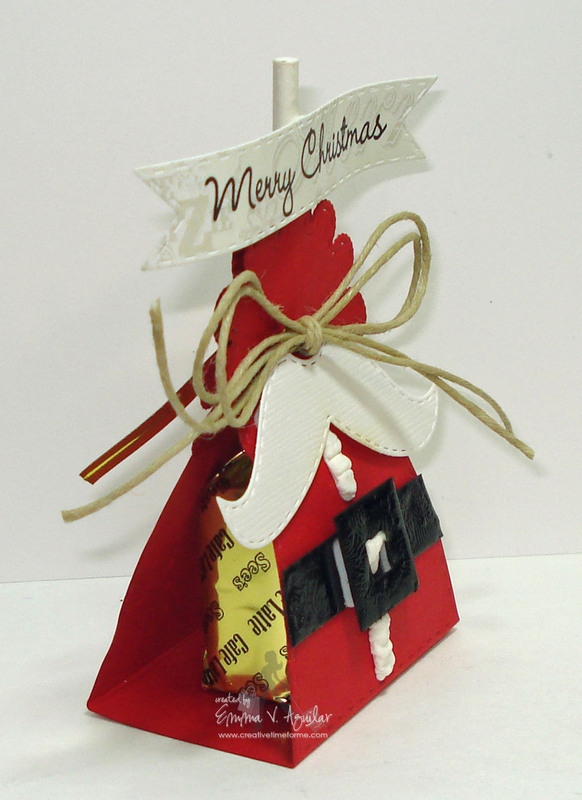 What an adorable Santa lollipop holder! I love how you always think out of the box, Emma! Wow.... I LOVE that Santa lollipop holder!!! Way too cute!! All of the projects are amazing!!! Thanks so much for sharing!! Gives me such motivation!!! I'm sure you'll hear this continuously, but this is so cute. My teenage granddaughters love mustache's so this is so appropriate for them. Soo in love with your Santa lollipop! Super cute. LOVE your project today!!! SOOOO cute!!! And all the design team did fabulous again today - as always!!! Your lollipop holder dressed like Santa is too cute! Absolutely adorable! Having so much fun seeing what your favorite crafty items are. TFS and thanks for the chance to win! these are so adorable and are perfect for parties, or little gifts for co-workers. I'm always looking for things like this! TFS! All of your projects are adorable. TFS. these past 4 days have been great, everyones projects are fantastic!!! great job emma!!! Another day of wonderful projects, love the little treat holder, all the design team projects are so cute. A great project. So cute. This is so cute & clever Emma! I'm loving all these fun projects! Oh Emma ~ look what you did with this die ~ I LOVE it!!! Well I LOVe that die anyway but this is WAY to CUTE again! So CLEVER too!!! I just love how your creative mind thinks ~ ALWAYS!!! Well the Dt's did it again!! I just LOVE all this inspiration happening here!! Okay off to see the details of everyone's project!! I just have a HUGE smile on my face right now!!! Again, the DT projects are sensational! Yet another project I love & the design teams creations are amazing!! Such a fun spin on a lollipop! Can't wait to make goodie pages for my nephews 4th grade class!! The santa lollipop holder is super cute. So many ideas. Super super cute lollipop holder! Love it! Thank you for sharing. super cute projects. really like leanne's santa. very cute. tfs. I love that treat holder. Very cute!! I to sometimes lay awake wondering how to make something and I go to my computer and look things up for ideas way early in the morning. This lollipop holder is adorable, Emma! Great idea for my bunco dinner favors! I guess I'd better get busy! This is so cute! Thank you for sharing this wonderful idea with us:)I so want to try to make some now:)lol. These are very cutie patooties! lol I love this idea. This is just too cute!!! I love how simple and cute it is! So cute! Love the belt and the mustache! Very cute Emma, thanks for sharing, your DT is doing a great job!!! These are very cute, Emma. Such a great idea! Thanks for sharing. I love when you make projects with the lollipop holder!!! and this santa is so adorable !! SUPER ADORABLE Treat Pop! I love all of your creative ideas! Thank you so much for sharing :) and yes, you're right....I do have a brand new bottle of the Crackle Accents that I purchased a while ago...definitely need to wipe off the dust and use it (lol) :) have an AWESOME day! Hello Emma, super yummy this treat holder,haha Thanks for share the video. It's very easy and super elegant. And the designer team did a super duper great job on the projects that show to us. Thanks for the opportunity and happy day. 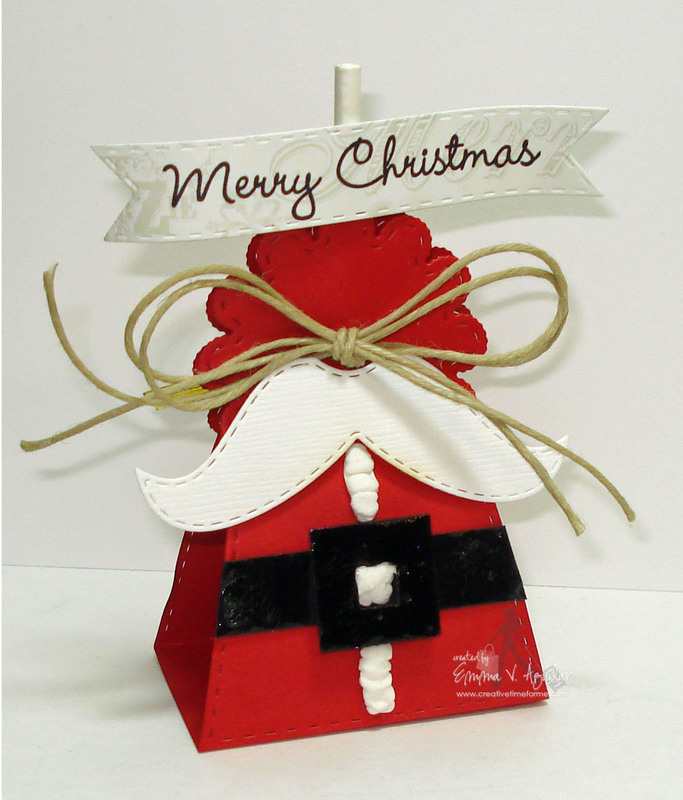 I have your lollipop holder die and will be making some of these Santas for my coworkers. Thanks for the terrific idea! Just lovin' all the creative Christmas inspiration. Super cute!! I think 90% of the blogs I come into contact with used this die last year. It is so cute and so versatile. Super cute Santa lollipop holder. Love this die, use it all the time. Love the die! Love the Santa! Thanks for a chance to win! Love all ideas you have done with this die. So adorable Emma!! I love this die and use it all the time. Cute Cute! I defintely will be making some of these. Very cute--I like the mustache and the crackle accents on the belt. These lollipop holders are just too cute. That mustache die set is really a versitile set. That is awesome!! That lollipop die is so versatile. The great ideas just keep coming and coming! Very cute lollipop holder1 I have seen your die used in so many ways on so many blogs!! Your Santa lollipop holder is really cute! The design team has again posted a wonderful assortment of projects. I love all the great ideas! Beautiful projects! This lollipop holder is so stinkin' cute! I love the mustache for the Santa! Super, super cute. I have to get that lollipop holder die. Love your videos! TFS your creation with us! Another fun and kreative idea...I don't like when I have krafters block too...can't wait for #5. You and everyone on your design team is so talented! Thanks for sharing! I am loving the 12 days of Christmas! Great projects and inspiration! Love all the treat holder ideas. The Santa nugget holder is adorable. You've convinced me that I NEED that lollipop die, this would be so cute for my son's Christmas party at school! This is such a cute project. Need to get me that mustache die. As always Emma, you surpassed the cuteness factor!! Hi Emma,I have the lollipop die & I LOVE it!One of my Favorite dies EVER!! Super Duper Cute Pop! !Adorable DT Projects! !very SWEET! Okay now that is stinkin' cute Emma!!! Very, very, very cute and makes such a great gift! What a fabulous idea to use the lollipop die. I might have to pull my die out to scrap lift this fun idea! Adorable lollipop holder. Thanks for sharing your ideas and talents!! Wow, Wow, Wow.....SUper Super cute! Love that little Santa treat!!! The See's' candy holders are adorable. Both yours and the Santa face one. What a versitle little box, it doesn't have to be a Santa, I can think of so man other characters! Thanks for a chance to win the twine! I love LOVE LOOOOOVE this. Super adorable!!! WOW! I'd like one of those lollipops!So cute! I love love love your santa pop holder - it is adorable! I am going to have to make these babies! Thanks for the inspiration! Oh, I love love love this Santa themed lolly holder. Makes me want to take out my die and get creative. Awesome as usual. Love it. I am loving all of the great projects you and the desing team have. Enjoying your creative projects! So very cute!!! So going to try the santa lollipop holder! Fun for the kids place setting at the table. Thanks! ANOTHER adorable way to use your lollipop die! You're making it so adaptable that I'm going to have to ask for it for Christmas! These projects are adorable. Thanks for the chance to win this incredible prize. What an adorable treat box. Just love it. Got a new item for my Christmas list!! I think I'm going to start giving away more lollipops! 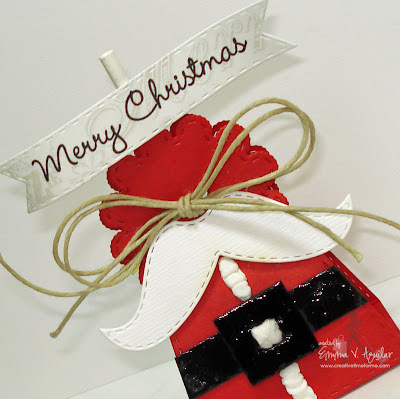 Yes it is an oldy but goody, your project is so cute, gr8t job! I do love this die, haven't thought of turning it into a Santa, thanks Emma. leanne's Santa - wow... adorable and i love your lolipop holder - great idea!! So many great ideas for gifts. Thanks so much. Super yummy! My students would love to receive one of these. Looking forward to the next day of projects. This would be great to use with the cake pops I am making for Christmas Day! That is a great gift idea. TFS. That is so cute. That lollipie die is SO versatile! Loving the mustache on Santa! All of them is soo cute!! TFS, LyLy. I love the little treat holders. I haven't made any like these. Something new to do. I also am lovin' the mustaches this time of year. 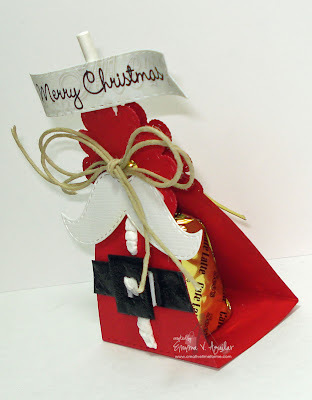 Wow this is simply adorable santa treat sacks. Thanks for sharing. Great job Emma- as always. the l. holder is too cute as a santa. Oh my goodness, how adorable. Where on earth do you get so many ideas. I love that holder...so cute with the mustache!! I love love love Nikki's project! Love the Santa treat holder! It's so stinkin' cute!! Thanks for sharing. Love this treat holder, it is really cute. Thanks for sharing. I want one of your lollipop holders! Too stinkin' cute! Your team doe such a great job! TFS! The Stitched Lollipop Holder Die is definitely on my Christmas list! So many uses for it and such adorable projects. Beyond adorable. I spy some SEE's candy.. .mmmm GREAT JOB. Cute. I will have to attempt these or something similar (Lol) for the grandbabies to pass out at school. I love having another way to use the die I got in my stash. Thanks, Emma!